Welcome to The Pentagon………and that’s just part of the view from the kitchen window!! You’ll find our Scottish holiday cottage in Wester Ross in the North West Highlands, just a few miles off the North Coast 500 scenic route. This is an area of outstanding beauty, combining stunning loch and mountain scenery, with magnificent white sand beaches, plenty of wide open spaces and lots of wildlife. If you want peace and tranquility, look no further. The Pentagon is a modern detached house in the small hamlet of Cove, near Poolewe. 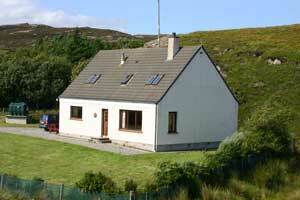 It is a self catering holiday cottage in a superb location and was named after its 5-sided plot. Close to the seashore, it enjoys stunning views over Loch Ewe to the spectacular mountains of Torridon and the Great Wilderness beyond. Deceptively spacious, it is double glazed throughout with an open fire in the lounge supplementing the electric heating. It is available throughout the year. The Pentagon is therefore ideal for that ‘get-away’ holiday surrounded by stunning scenery, whatever the weather or season. STOP PRESS – Internet access via satellite broadband is now available. Click for details. This was our first visit to Scotland…we don’t think it will our last! !